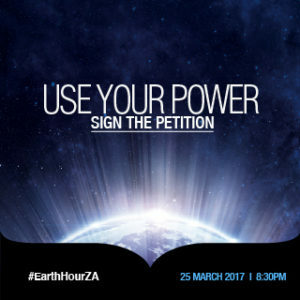 World Wildlife Fund (WWF) South Africa is organizing a petition calling on Eskom, the national electricity public utility, to expedite the use of renewable energy in the country as part of this year’s Earth Hour campaign. This programme has been put on hold for well over a year after Eskom refused to sign off outstanding Power Purchase Agreements. Dr Morné du Plessis, CEO of WWF South Africa, commented: “In order to avoid the extreme impacts of runaway climate change, we need to reduce our carbon emissions urgently by introducing more renewable energy into the energy mix. Yet, the bulk of South Africa’s carbon emissions come from electricity generated by fossil fuels such as coal and oil. This has to change.